1) How can I list my business on MYINFOLINE? It’s quick and easy to list your business here for free. Your business won’t appear on the site immediately as it can take up to 48 hours for our database to update. Don’t forget to add content to your listing including a description, images and deals at Your Business Centre. 2) How do I register as the owner of a business already listed on MYINFOLINE? If your business is already on MYINFOLINE but you haven’t claimed it yet, click "Claim this listing" in the top right-hand corner of your business listing page. 4) How do I manage my business listing? To add or edit content on your listing, login and update your listing in Your Business Pages. If your business is already on MYINFOLINE but you haven’t claimed it yet, click "Claim this listing" in the top right-hand corner of your business listing page. 5) How can I get my business listing to show up in every suburb or postcode I service? Priority, Basic and Free business listings will only appear in searches for the postcode in which your business is physically located. However you can purchase premium advertising products for any additional locations you cover. Read about our different Advertising Products to help you decide on the best solution for your business, or contact a MYINFOLINE sales representative to find out more. 6) What are the business listing rules? So our business listings get your message across quickly and effectively there are a few rules to keep them in order. •	The business name should be just that, your registered name, sole trader name or domain name. It needs to be in title case (which in most instances means each word starts with a capital and the rest of the word is lowercase) for easy readability and can’t include extra descriptions. •	A business can only have one Priority, Basic or Free listing per business. You can only purchase a Priority or Basic listing under another physical location if you have an office, franchise or place of operation in that location. Proof of this will be required. •	Each listing requires a business name, physical address (no PO Boxes) and phone number. An email address is advisable if you have one. If you’re a dot-com business we’ll need your head office address. If for any reason you don’t want to display your address it can be suppressed. •	If you want to market beyond your physical address you can purchase a premium advertising package. •	If you’re a mobile business you cannot purchase a listing for each location you cover. Top of List, Tile and Strip advertisements are the best fit for your business. 1) Why does MYINFOLINE let people rate and review businesses? Consumers like to hear what other people think of a business before using it, and they like to spread the word about their own experiences. Businesses have always relied on this kind of word-of-mouth to get new customers; the only difference today is that it happens online. 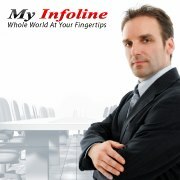 So MYINFOLINE’s business reviews help consumers and businesses. Ratings and reviews allow consumers to give businesses constructive feedback, letting them know if consumers like what they’re doing and giving businesses a chance to respond. Read more at our review guidelines. 2) Can businesses receive alerts when a review about them is published? Yes. If you have a business already listed on MYINFOLINE, open your business page and clicks "Claim this listing". Once you’ve claimed it you’ll receive free email alerts whenever a new review about your business is published. If your business isn’t listed on MYINFOLINE, list your business here for free. 3) Does MYINFOLINE moderate reviews? 4) How should businesses handle negative reviews? Encourage other clients to review your business - lots of good reviews will quickly outweigh a poor review. The most recent reviews appear first, so any older reviews will be pushed towards the bottom of the page. 5) Can I report a review for being inappropriate? Yes. Click the flag icon found under every review and comment. Read more at our review guidelines. 1) My business has closed down or changed management. How can I let MYINFOLINE know? Please let us know through the Report an error form. 2) The business I’m looking for isn’t listed on MYINFOLINE How can I get it added? If you’re not the business owner, report a missing business here. Report a missing business here. 3) I’ve found a business with duplicate listings. How can I let MYINFOLINE know? Submit Inaccurate report , "Report Inaccurate" link is top right corner of Business Listing. 1) How do I join MYINFOLINE? If you want to add your business to MYINFOLINE, list your business here for free. 2) How do I write a review? You can write a review on any business you’ve used on MYINFOLINE. Read more about writing a review. 3) I’ve forgotten my password. How can I retrieve it? Don’t worry; it happens to the best of us. You can reset your password by clicking the "Forgotten your password?" link on the login screen. 4) How do I change my display name, profile picture, email address and password? All these details can be changed once you login. Just click at "Your profile" and then "Settings" on the right-hand side and edit all information excluding email, email id is not changeable. 5) Who can see my profile and my reviews? Any visitor to MYINFOLINE can read your reviews, view your profile and your profile picture. Your contact information will not be displayed to anyone publicly. 6) What does MYINFOLINE do with my personal information?